Ansonia’s Devyn Sink (2) takes the hand off from quarterback Hunter Buckingham and then bursts threw the line on his way to a 62-yard touchdown run to give the Tigers a 7-0 lead in the first quarter. However, Fort Loramie won the game, 37-10. Ansonia’s defensive gang-tackled Fort Loramie runner Carter Mescher early in the game. Involved in the tackle for Ansonia are Ethan Fischer (5), Ross Shook (71) and Andrew Rowland (75) among others. Fort Loramie won the game, 37-10. Ansonia’s Brock Shellhaas (23) looks for some running room on Friday night as the Tigers traveled to Fort Loramie for a Cross County Conference battle of unbeatens. The Redskins won the game, 37-10. Ansonia’s Devyn Sink (2) tries to get away from would-be tackler Devin Wehrman (2) on Friday night as the Tigers traveled to Fort Loramie for a Cross County Conference battle of unbeatens. The Redskins won the game, 37-10. Ansonia’s Hunter Buckingham (4) takes down Fort Loramie’s Mason Kemper (6) after he caught a pass from quarterback Collin Moore on Friday night in a Cross County Conference battle of unbeatens. The Redskins won the game, 37-10. Ansonia’s Hunter Muir (27) tries to hang on to Fort Loramie runner Nick Brandewie (4) on Friday night as the Tigers traveled to Fort Loramie for a Cross County Conference battle of unbeatens. The Redskins won the game, 37-10. 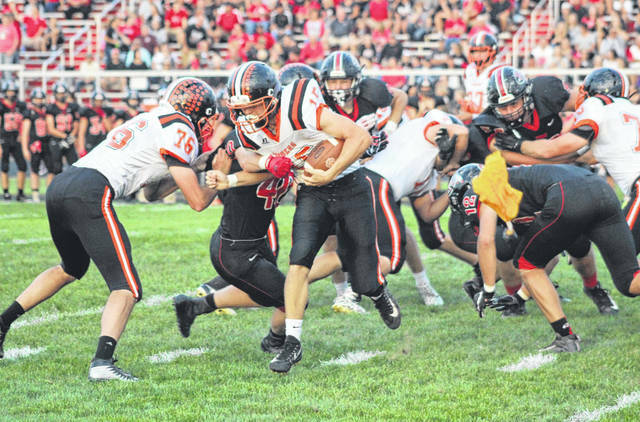 Ansonia’s Matthew Shook (15) tries to get around the end of the line for some running room on Friday night as the Tigers traveled to Fort Loramie for a Cross County Conference battle of unbeatens. The Redskins won the game, 37-10. 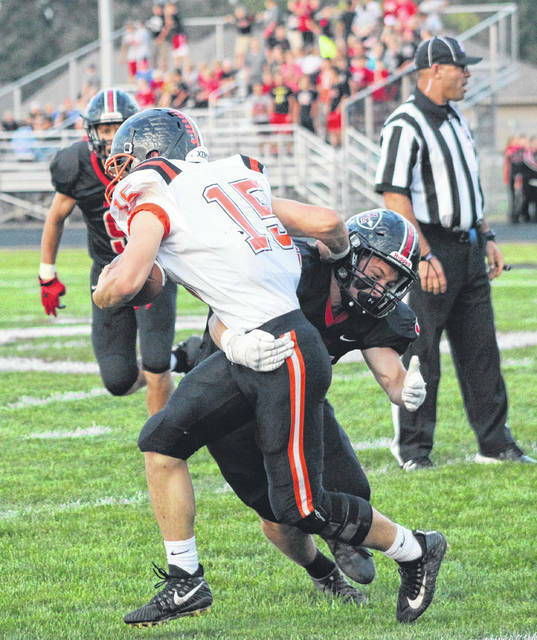 Ansonia’s Matthew Shook (15) tries to break free from a Fort Loramie defender on Friday night as the Tigers traveled to Fort Loramie for a Cross County Conference battle of unbeatens. The Redskins won the game, 37-10. 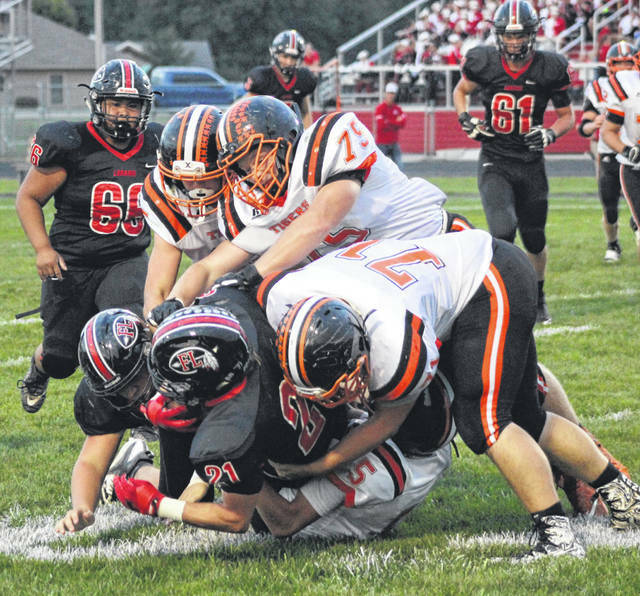 FORT LORAMIE – It was a game of execution for the Ansonia Tigers on Friday night. In the first half, the Tigers executed well and had the lead on two separate occasions. In the second half, not so much. 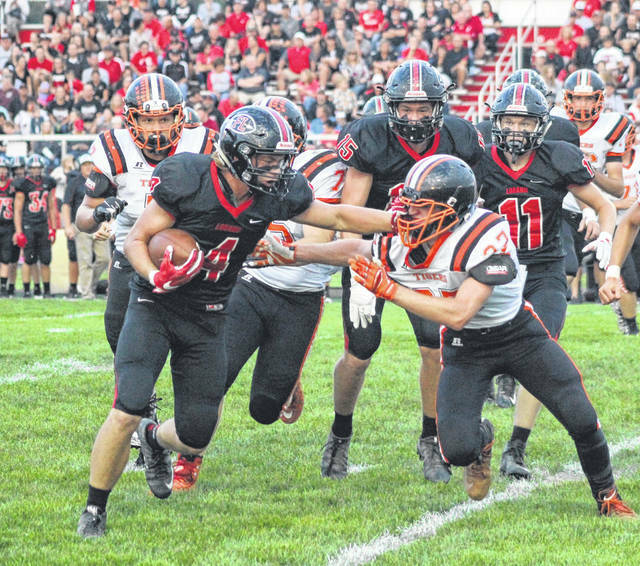 A late first half touchdown by Fort Loramie gave them a 14-10 halftime lead over Ansonia, but the Redskins dominated the second half scoring 23 unanswered points to cruise to a 37-10 win over the visiting Tigers. Coupled with Mississinawa Valley’s loss to Twin Valley South and Fort Loramie now sits atop the Cross County Conference standings alone with a 3-0 record in conference play. They are 4-1 overall. Neither team did much of anything with their very first possessions, but when the Tigers (3-2, 2-1 CCC) got their second opportunity, Devyn Sink made it count as he burst through the hole in the middle of the line for a 62-yard touchdown and a 7-0 Tigers lead. 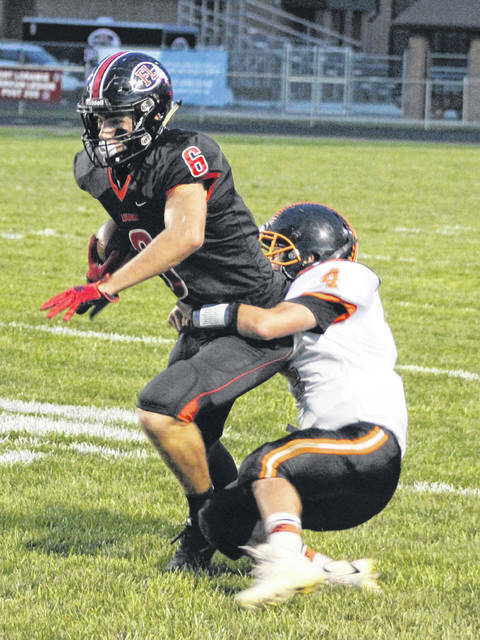 However, Fort Loramie’s next possession was just as successful as the Redskins took over on their own 43-yard line and went 56 yards in five plays capped by a 28-yard touchdown run by Carter Mescher and a 7-7 tie game at the end of the first quarter. It was the first of two touchdown runs for Mescher, who carried the ball just four times for 87 yards and two scores. He also had 41 receiving yards and a touchdown catch in the game. Even with the game tied 7-7, Ansonia looked to have the momentum going into the second quarter, but on Fort Loramie’s first play of the period, quarterback Collin Moore’s pass appeared to be intercepted by Ansonia, but the officials ruled incomplete. It was the second questionable call in the game that favored the home team. 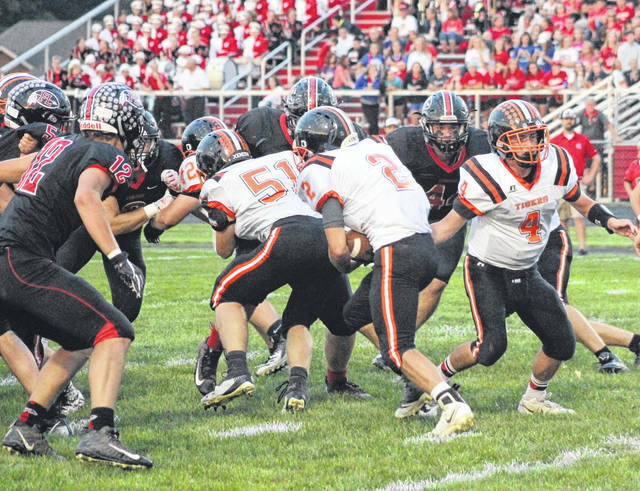 In the first quarter, the Redskins punt returner appeared to fumble an Ansonia punt which the Tigers recovered, but the officials gave possession to Fort Loramie. 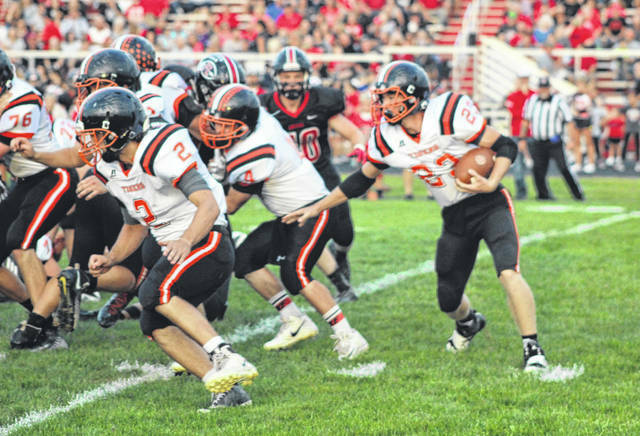 With 1:17 left in the first half, the Tigers had driven the ball from their own 20-yard line all the way to Fort Loramie’s 18, but facing a fourth down and 5 yards to go Ansonia opted for a field goals attempt. Michael Hall put in through the goalposts from 35 yards out and the Tigers had a 10-7 lead as they gave the ball back to the Redskins with a little more than a minute to go before halftime. That turned out to be more than enough as Fort Loramie got the ball near midfield and capped off a seven-play, 49-yard drive with a 14-yard touchdown pass from Moore to Mescher to take a 14-10 lead into the locker room at halftime. The Redskins dominated the second half forcing the Tigers into four straight three-an-out possessions while they put points on the scoreboard on their first three possessions of the second half for a commanding 30-10 lead with one final quarter still to play. “Sometimes we don’t always play with focus,” Wells said. “We don’t always read our keys and do the discipline job. We just needed to play more as a family and that’s everybody doing their job together. When we play as a family and as a team it is fun to watch. You can see the difference. Nick Brandewie scored the final touchdown on a 37-yard run with 11-plus minutes to play in the game for Fort Loramie. The Redskins had more than 400 yards of total offense with 186 yards through the air and 267 yards on the ground, while Ansonia had slightly less than 200 yards of offense with 163 yards rushing and 18 passing. Sink led the Tigers ground attack with 9 carries for 93 yards and a touchdown. 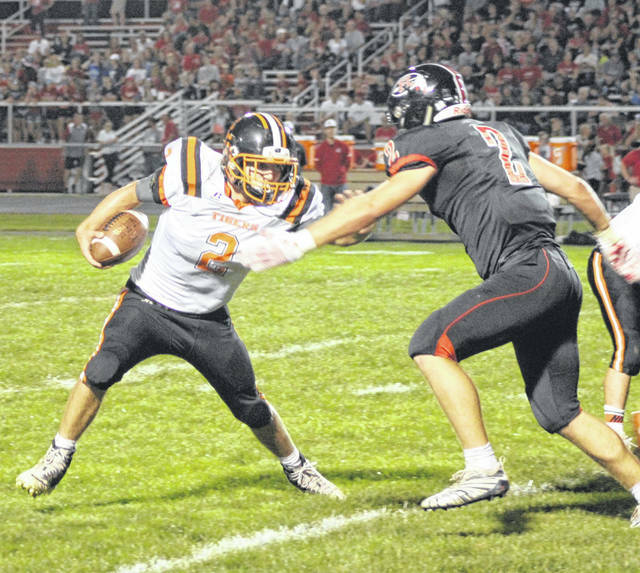 Matthew Shook had 121 carries for 37 yards and Reece Stammen had 10 touches for 33 yards. For Fort Loramie, Moore completed 14-of-29 passes for 186 yards and a touchdown. Mescher was his favorite target with five catches for 41 yards and two scores.Mason Kemper also had four receptions for 53 yards for Fort Loramie. Brandewie was the leading rusher with 89 yards and a touchdown. “We were prepared for their passing game,” Hoening said. “We had a lot of near interceptions, but we just didn’t finish it off. They didn’t do anything we hadn’t seen before. Once they got a couple scores up on us they were able to run the ball. Ansonia will host Mississinawa Valley next Friday, while Fort Loramie will head to Twin Valley South. This entry was tagged Ansonia Tigers, Carter Mescher, CCC, Collin Moore, Devyn Sink, Eugene Hoening, Fort Loramie Redskins, High school football, Matthew Shook, Spencer Wells. Bookmark the permalink.